We are the Muncie Area Amateur Radio Club, an American Radio Relay League affiliated Special Service Club. Our club callsign is WB9HXG and we are located in Muncie, Indiana. MAARC proudly supports Ham Radio and our neighbors in Delaware and the surrounding counties of East-Central Indiana. We are a diverse group of individuals who enjoy exploring all areas of the engaging, unique and fascinating hobby of Ham Radio. We cordially invite all persons and families-- young and old, visiting the area or in residence-- to make our acquaintance, learn about what we do and participate in our activities. You need not be a member of any club or organization, and for our off-the-air activities you don't even need to be a licensed Radio Amateur. All are welcome. Our meetings and events are always open to the public, we relish the opportunity to meet new folks. 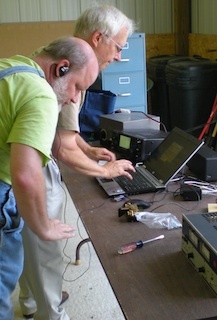 Amateur Radio is not a focused, easily defined activity- there's an amazing amount to explore. It centers of course on radio communications, but where that leads is entirely up to the individual. We talk, we craft, we explore and we help. We do these things through our individual talents and our collective wisdom with folks from around the world. Amateur Radio is both a social and technical hobby that anyone can take up and succeed at. If you would like to know more, MAARC stands ready to assist-- contact us via email anytime. We can answer your questions and help you work towards getting your first FCC Amateur Radio callsign.